Studying Japanese while in Japan is a given, but it can be difficult to know where to start, or what to do when you hit a plateau. The following is a collection of level-appropriate study tips and resources to help you at whatever stage you’re at. Everyone learns differently, so if you have any tips or resources to share (or questions about the resources below), contact the CIR PA.
First, decide what exactly you want to study and set some goals. Especially for those starting out, a solid foundation of grammar is really important, while if you want to reach the intermediate or advanced level, taking kanji seriously from the early on will pay off in the long run. There are many different benchmarks you could use: tests (JLPT, BJT, J-Test, J-Cat (a free online test offered for research purposes), Nihongo Kentei, Kanji Kentei, etc. ), Japanese for business, your daily life, hobbies, etc. Once you have the basics down, you can tailor your studies to suit and achieve your goals. At the beginner level, a class or private tutor is particularly helpful. Japanese is very different from English, and a teacher can help walk you through understanding these differences and make sure you properly learn the basics. Classes are available in various parts of the prefecture (try contacting SPIRA), as well as online. Don’t be afraid to ask your JTEs or other coworkers for help–you are surrounded by native speakers every day! Beginner: Genki I + II, Japanese for Busy People, Minna no Nihongo, the JET Programme CLAIR Courses (you must sign up through your CO), TextFugu (online), Tae Kim’s Guide to Japanese (online, free), and Maggie Sensei (online, free). Intermediate: An Integrated Approach to Intermediate Japanese, Tobira. Upper Intermediate: Authentic Japanese: Progressing from Intermediate to Advanced Japanese. All levels: The Dictionary of Japanese Grammar (Beginner, Intermediate, Advanced). You can also learn about more learning options here. The JLPT may not be the perfect test, but it provides a good progression from beginner to advanced, and passing it can be both a great personal goal as well as a good resume builder. The content of Genki I is roughly equal to N5, Genki II to N4, and An Integrated Approach to N3. Around N3, JLPT-focused texts tend to be the most helpful. There is no shortage of texts available in larger Japanese book stores at reasonable prices. Spend some time browsing the texts in the store to decide which ones best fit your learning style. JGram, Renshuu.org, and Imabi have resources for grammar that appears on the JLPT, as well as example sentences and community-written explanations. Renshuu also has resources for vocabulary and kanji. Udemy offers a combination of videos and PDF material online. The course fees are quite high, but the company often runs sales. Bunpro, a tool to learn Japanese grammar, divided by JLPT level. The BJT is much more business-focused than the JLPT. If you want to work in a Japanese office environment in the future, you will likely find the content very relevant. There is only one written test and you are awarded a level from J5 (lowest) to J1+ (highest) based on your performance, as opposed to JLPT’s five-level, pass-fail system. The content is pretty challenging, and the test organizers recommend attempting the test after achieving the equivalent of N2 ability and after getting comfortable with keigo. Unfortunately there are very few resources specifically for the BJT, but the official books are relatively helpful and are good practice for basic business reading and listening. If you are considering taking the BJT, check out Hannah’s experience taking it at the Fukuoka testing center. Keigo is important for pretty much any professional environment in Japan. It’s not the most fun aspect of the language to learn and most people are fine with letting it slide because it’s difficult to master or they simply don’t need it in their private life. However, understanding keigo can make daily life a little easier, and it’s nice to be able to show respect when you want to. Genki and An Integrated Approach both cover the basics of keigo. If you want a different approach, ちびまる子ちゃんの敬語教室 is a manga highly recommended on Amazon for children. 日本語敬語トレーニング is a good step up, though covering it with a tutor will help clear up a lot of confusion. そのまま使える敬語ハンドブック, 敬語すらすら, 敬語使いこなしパーフェクトマニュアル, etc. are keigo books aimed at native speakers. Japanese people struggle with keigo, too! It is easy to get overwhelmed by the shear number of kanji and avoid studying them in earnest, and if you are solely focused on spoken Japanese, they may seem irrelevant. However, solid kanji recognition will not only make reading possible, it will make your daily life in Japan much easier. And kanji study also has the added bonus of adding to your vocabulary! Remembering the Kanji is a book series meant to teach the meaning of all common use kanji and then some. Though it is recommended to start with zero kanji knowledge, it can also help reinforce information you’ve already learned. Wanikani is a web-based subscription service which uses SRS to teach you kanji based on frequency of usage. It does so by first teaching radicals, then kanji. This is another service that’s designed for those with zero kanji knowledge, though again it can’t hurt to review. Read the Kanji is another web-based subscription service. The user types in the reading of the kanji that is displayed. Memrise.com has many different kanji lists and uses an SRS system as well as a mnemonic system. 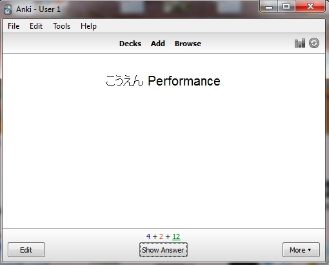 This means it works particularly well for studying using the Remembering the Kanji method, and such decks are available with multiple user-made visual mnemonics. Anki is similar to Memrise but doesn’t have a time limit associated with it. Apps and games: There are a lot of kanji-focused apps and DS games designed for Japanese children to learn kanji. And for those who prefer the old fashion book, pen, and paper method of studying kanji, a good kanji dictionary can be a great asset! A number exist for English-speaking learners, so browse through a few to choose the one that best works for you. Some things to consider are the quality of the definition of the kanji themselves, stroke-order depictions, the order in which the kanji are introduced, whether readings are introduced in kana or romaji, and the number and quality of example words using the kanji. Remember, you might not need the biggest, most in depth dictionary out there if you’re just starting out! …then check it. After writing it 10 times, select how difficult it was to recall the kanji – this affects how long before the next review. Studying kanji super hard and want a certificate to show for it? The Japanese Kanji Aptitude Test (commonly called Kanji Kentei or Kanken) might be a good goal for you to pursue! The Kanji Kentei is administered three times a year (or year round, if taken on computer) in 12 different levels. This test checks not only for the ability to read kanji, but also to write kanji based on context, recognize radicals, and more. Kanji Kentei study books – there are a lot out there! Any bookstore will have them, so browse and find one that’s best for you. Kanji study apps – there are a variety of applications for both Android and Apple. Other kanji materials can be re-purposed for the Kanji Kentei. Just be sure to confirm which kanji are covered in the level you are studying for because the order of appearance on the various levels of the Kanji Kentei differs to some extent from the order for the JLPT. For more information on the Kanji Kentei, read about Hannah’s experience with the test. It can be difficult to find the motivation to study vocabulary, but in reality one of the more important skills. Grammar can be understood with reason and there are a limited number of grammar points, and there are also only a limited (though granted, large) number of common use kanji to master. Whereas the list of vocabulary out there you could learn is virtually endless! 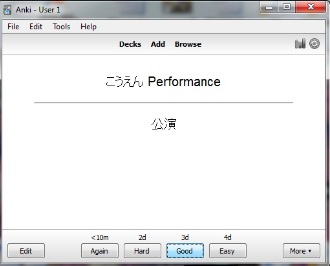 Anki: Very customizable and the tried-and-true option for SRS vocabulary building. Memrise: Anki is customizable, but can be a little daunting for new users. Memrise makes up for more limited customization with an easy-to-use design and points system. Wanikani: teaches you vocabulary based on the kanji you are learning. Many textbooks and websites also exist with lists of essential words used in example sentences. A key step in truly understanding and be able to use vocabulary is encountering it in context, not in isolation on someone else’s simple word list or the like. Consider using an SRS system in combination with such resources to create your own, customized study program that allows you to pick up new vocabulary while understanding the context in which it should be used. Speaking and listening are fun skills to work on if you have Japanese friends or enjoy chatting with your coworkers, but not everyone has someone they can talk with every day. There are a variety of shadowing textbooks available, and mimicking any dialogues on other learning CDs is great practice too! Japanese Pod 101 is also very popular, especially at the intermediate level, and has a lot of sales. Of course YouTube has plenty of resources for free. What do you do if you don’t know a word? There are plenty of paper dictionaries available, though they are quickly becoming obsolete in the face of new, intelligent smartphone dictionaries. Jisho.org is very useful for most vocab up to post-N1. You can also use the Classic Version if you prefer that interface. Weblio: A Japanese dictionary service. It usually gets the job done when jisho.org can’t. ALC also has a great database. Electronic dictionaries are usually aimed at Japanese learners of English, but they work both ways. And unlike website and many apps, they do not need an internet connection to use! The styles, target audience, and price vary quite a bit, so research before buying. Nintendo DS: 漢字そのまま is a game that turns your DS into an electronic dictionary. It’s not as professional looking, but more affordable if you already have a Japanese DS. Linguee: Searches a database of professionally translated texts to see how a given word has been dealt with in a variety of situations. This is recommended for very specialized terms. Smartphone apps such as Japanese and Imiwa are great for a quick lookup. When all else fails, reverse search! Often Japanese people will be confused by the exact same word. Type in the word or phrase in question plus “英語” or “とは” and there will likely be plenty of question and answer pages. Particularly, Chiebukuro on Yahoo often pops up with great explanations! And there are plenty of other textbooks and non-traditional study methods, too! Tackling a “real” book or newspaper article can really build your confidence. There are graded readers and children’s newspaper articles available online for the lower levels (check out NHK News Easy), and from N3 or N2 you can definitely start to tackle simpler novels. Romance stories are not everyone’s cup of tea, but they usually deal with very easy-to-understand topics and use every day language. The 英語で話すseries places an English translation next to original Japanese text, and covers a lot of different topics. Careful, though: quality may differ by the book. Playing video games in Japanese is another great way to get some practice. Playstation systems aren’t region-locked, and you can pick up some cheap games at Book Off. From N2 or N1, you can pretty much explore anything you want. The newspaper is a great place to start, and will give you something to talk about with coworkers. If you want to start with a structured approach to reading and listening to the news, ニュースの日本語 聴解 40 and 50 are great resources. Karaoke helps build reading and speaking skills, and has the added benefit of not feeling like you’re studying. Also try shadowing. You can either use special shadowing textbooks such as シャドーイング日本語を話そう, or just use anything for which you have both a (native) recording and a script. News broadcasts are also a great source of “proper” Japanese pronunciation. TV is great for improving your listening! Difficulty and usability vary depending on what you watch, but variety/talk shows are good for simpler topics, and the news is good for a challenge. NHK’s asadora (morning dramas) run for months at a time, and episodes are fairly easy to digest at only 15 minutes. If you’re into anime or dramas they can surely help too, as long as you’re careful what you watch. For example, shows like Sazae-san and Detective Conan can be easy to understand, but Shingeki no Kyojin has so much specialized vocab and screaming that things get complicated. You can often find many episodes of various shows on YouTube. Note that you should not take cues from anime characters on how to speak Japanese in everyday life (it may not end well). Want to practice listening while also learning to cook something new? 三分クッキング is broadcast six days a week and teaches how to make one dish per day with clear instructions. The name is misleading, but at only seven minutes long, it’s also easy to make time to watch on a regular basis. The six newest episodes are free to view online. Bobby Judo, a local TV personality, recommends watching English-language movies with Japanese subtitles. You can compare the subs to the dialogue and get a good feel of how common English phrases would be translated into Japanese. For writing practice, lang-8 is great. You can get native feedback on writing, though there is an incentive system which encourages you to correct entries in your native language. Kumon offers two Japanese courses: one for foreign learners (which can be taken at their centers or as a correspondence course) and a kokugo (Japanese for Japanese native speakers) course aimed at Japanese kids. It’s not a common method, but works for some people. Simply getting involved can help you improve and stay motivated! Find friends with common interests so studying doesn’t feel like studying. Talk to coworkers and people you see often, don’t be shy! It can be challenging, but once you start making connections and using your Japanese, it will really pay off. Learning a new language is something with no foreseeable end, so don’t treat it like a task to get over with. Set short-term goals that will directly improve your quality of life and you will find you enjoy your time in Japan all the more.